My 2016 year review and what’s to come! Although 2016 has been a terrible year in many ways, it has also been a great year for many. Brexit, Trump, celebrity deaths – we all have our reasons for hating 2016, but there are also reasons for people to look back with pride. But the amount of celebrity deaths has been shocking for this year! Whether your year has been made by personal achievement, a heartwarming story in the news, or from something as simple as the release of a film, TV show or song, embrace it. For me personally, I’ve had a year full of ups and downs, mostly ups, and in terms of my writing it’s been very satisfying. My psychological thriller, Deception, has not disappointed. It has received nothing but praise, and has an average rating higher than my other books across Goodreads, Amazon and Barnes & Noble ; which I’m extremely proud of. There was also the release of my short dark fantasy story, Alive, which I’m very happy with because just like Deception, it’s a genre I’m not used to. For you reading this right now, try something new for next year. If you want to try something new and it’s out your comfort zone, just do it, you have nothing to lose. And who knows, it may pay off! Roll on 2017 I say, and roll on the final book of my book series, The Endurance Series, coming in the New Year! You will be aware that my brand new short story ‘Alive‘ is available to download from Amazon on Kindle/eBook; and because it’s new, and because I want everyone to read it, I have made it completely free for this weekend. Starting from today and lasting till late Sunday and early Monday morning, you can download my new book for FREE. In return, I would love it if you reviewed Alive on Amazon, Goodreads, on your blog and even shared it amongst your friends and followers on your social media pages. Find out more about my new dark fantasy story Alive by checking back to my previous post Check out my short dark fantasy story ‘Alive’, or even by going over to it on Amazon. Dark fantasy is a new genre for me, but I really like this short story. It’s full of mystery, it’s dark and most of all, it’s creepy. Download Alive today onto your Kindle without paying a single penny. I wrote this short story for a university assignment in my final year. I’ve let the story stew a little over the past year or so, and I’ve even had some spare time to try and extend it into a full length novel. But with my other commitments to working on my upcoming novels DECEPTION and Endurance: Recovery, I feel that Alive is probably best (at the moment) to remain as a Dark Fantasy short story. I’ve priced the book at the lowest price I could list it for, and I am hoping that many people will be able to read my short story, and give me their opinion on my brand new eBook. This story is different to my normal books – The Author is a mystery thriller novel which plays on literature, writing and story telling (a book within a book novel); The Endurance Series is an action-packed, fast-paced, dark, creepy, apocalyptic and dystopian book series; DECEPTION (set for release in the summer of 2016) is a thriller novel based on a lonely prowler and avid dog walker; and my brand new short story, Alive, is a dark fantasy about a woman who has left her family – whom believe her to be dead. Download Alive today on Amazon for eBook and Kindle. 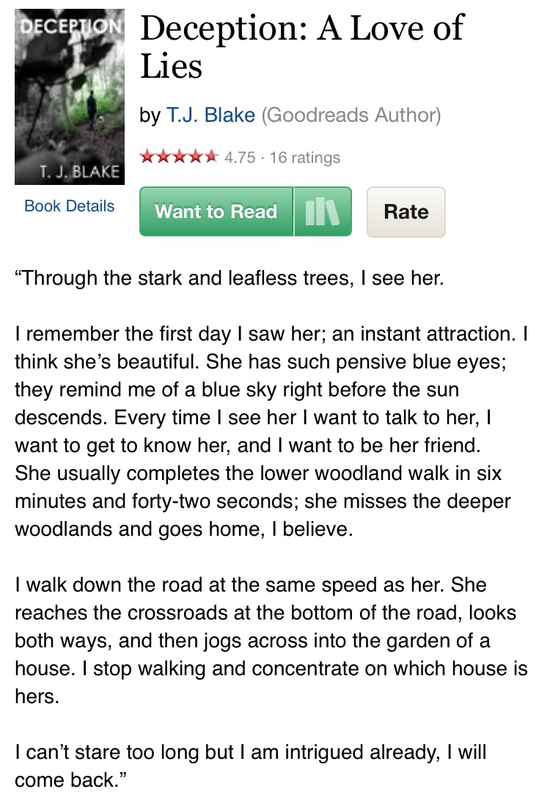 If you want to hear more about me and my books, then feel free to see my ‘Book by T. J. Blake‘ section of my blog. Here’s the official front cover for my new dark fantasy short story, Alive. Alive will be available to download on Amazon for eBook and Kindle soon. I am happy to announce that I will be releasing my short story, ‘Alive’, exclusively to Amazon on eBook format very, very soon. Keep an eye out for its release – it could be within the next few days! New dark fantasy short story ‘Alive’, coming soon!